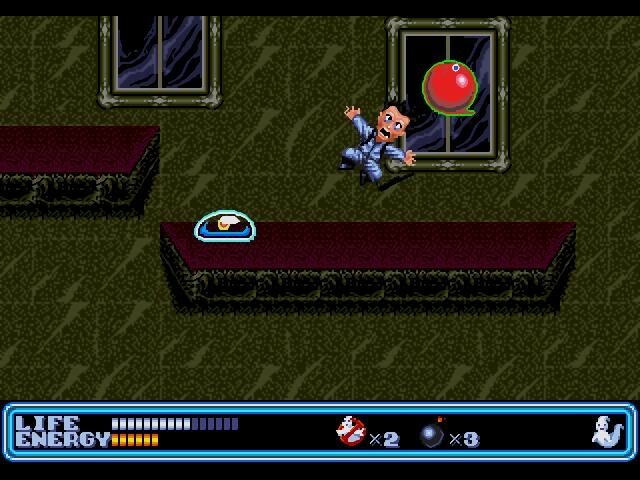 Ghostbusters on Sega Genesis was quite a departure from what Ghostbusters games had been up to that point. You have the option to play as Venkman, Stantz, or Spengler that did a good job of replicating the likenesses of the actors. They take the form of a caricature design with big heads and small bodies. They all have varying attributes. Ray is slow but has high stamina, Egon is fast but has low stamina and Peter is the average player. There are 3 difficulties, Easy, Normal and Hard. Action takes place in the traditional 2D platform style. There is an Item Shop where you can find things to restore your health, bombs and Ecto Goggles. There are also an abundance of weapons in the Weapons Shop. Instead of proton beams, your weapons shoot projectiles that will defeat ghosts and earn you money to buy items. You also can hold bombs as a helpful weapon. The levels are non-linear in the sense that you don\'t go straight through to get to a goal. You have to find your way around and beat all the boss ghosts in various rooms. After you beat a Middle Ghost, a small green ghost appears and you get to use your beam to catch him in the Ghost Trap. You have an option on the map screen of where to go. There is a regular house, an apartment building is covered in ice, a house that is on fire, and the high rise building where the Stay Puft Marshmallow man is the main boss. After defeating each level, you get money from the haunted tenants and a piece of a stone tablet is received. When the four initial stages are completed, the next level, the Castle, is opened up. Here in the castle, you have to fight and rescue your 2 Ghostbuster friends who have been possessed as well as a few other boss ghosts. After the Castle is beaten, the final level, The Deep Hole, opens up. Many boss ghosts from previous encounters must be beaten again. The final boss is Jenna, the Goddess of Death and Destruction. Beating the final boss, you receive a mystical gem that along with the stone tablet, close the ghostly portal and save the city! This page was last edited on February 7, 2013, at 07:49.